At a Chevron oil refinery in Hawaii, researchers are growing microalgae in a 5,000-liter photobioreactor, flowing wastewater from the refinery through the reactor, and taking advantage of the algae's appetite for chemical nutrients to polish the water, removing noxious chemicals, including 90% of the ammonia-nitrogen and 97% of the phosphorus. 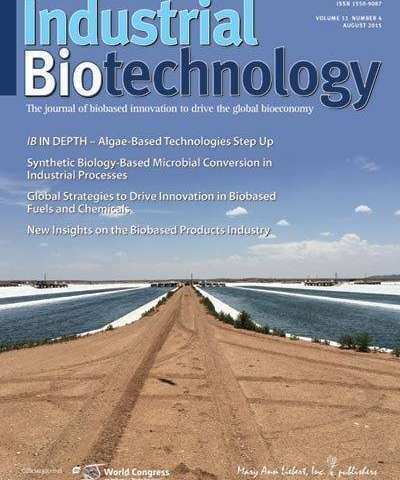 As the microbes feed, they grow and multiply, providing a wealth of algae-based biomass for producing bioenergy and high-value biobased chemicals and specialty products, as described the article "Algae-Mediated Valorization of Industrial Waste Streams" in Industrial Biotechnology, a peer-reviewed journal from Mary Ann Liebert, Inc., publishers. The article is available free on the Industrial Biotechnology website until October 25, 2015. Michael Perez, Norie Anne Nolasco, Amit Vasavada, Martin Johnson, and Adelheid Kuehnle, Kuehnle AgroSystems, Honolulu, HI, provide a detailed description of the design and operation of the pilot wastewater treatment facility. The bioreactor contains a mixed microbial consortium that is enriched for Scenedesmus algal species. The authors also describe experiments evaluating the ability of Chlorella and Scenedesmus algal species to grow on the sugars derived from waste wood obtained from pulp and paper mills and pretreated using enzymatic hydrolysis to release the pentose and hexose sugars. They tested and compared the algae biomass production from three types of waste wood: pine softwood, southern hardwoods, and northern hardwoods. "This is an exciting story on how the engineering of microbial consortia can lead to the development of robust waste management processes," says Co-Editor-in-Chief Larry Walker, PhD.